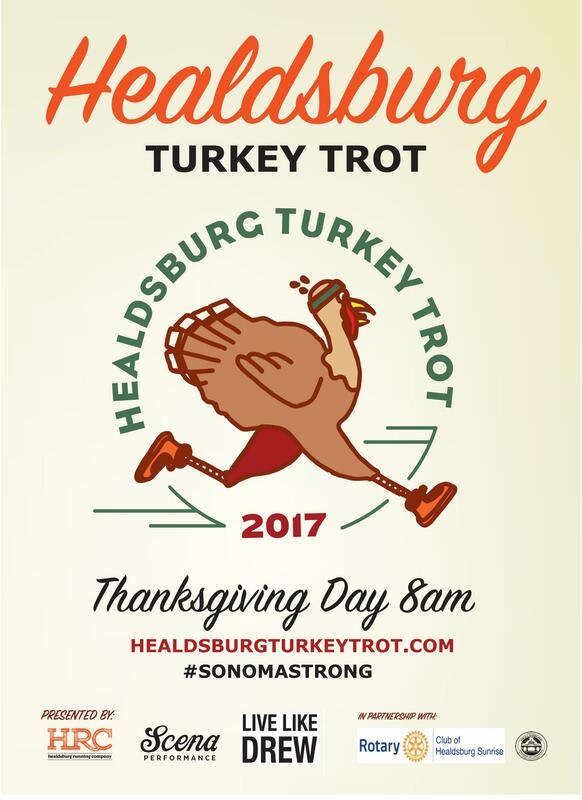 Show you’re #SONOMASTRONG with us on on Thanksgiving morning by running The Healdsburg Turkey Trot. This 5K run/walk through downtown Healdsburg has new meaning this year with the fires that have displaced so many of us. Join us! Let’s celebrate life together before giving thanks for the rest of your day. Race day, time, cost. The race is on Thursday, November 23, starting at 8am. Registration costs $35 for adults/$25 youth, age 6-18, $15 kids 5 and under. Shirts! Everyone that registers before November 9 is guaranteed a limited edition Healdsburg Turkey Trot t-shirt. The later you enter after November 9, the less flexibility we will have to give you a shirt, or shirt in the size you’d like. We’ll do our best! 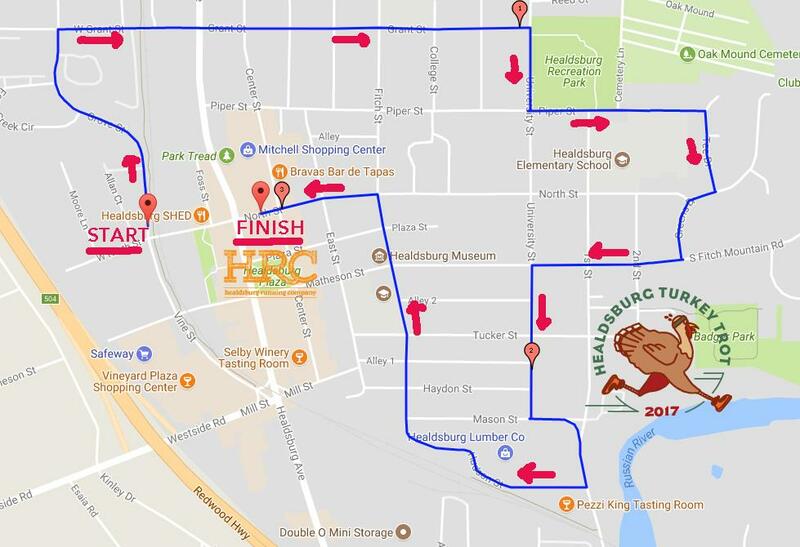 Bib pickup: There will be bib pickup and registration on Tuesday, November 21 from 12 – 6 and Wednesday, November 22 from 12 -6 at Healdsburg Running Company (333 Center Street). There is also race day bib pickup and registration, starting at 6:30am on Thursday, November 23. Because of the size of the race, we recommend registering EARLY. Awards: Prizes will be awarded to the top 3 male and female finishers, as well as to the first place boy and girl. #SONOMASTRONG Part of each entry and all the sponsor proceeds will be given to Rotary Club of Healdsburg Sunshine and be used to support those directly impacted by the fires in Sonoma, Napa, and Mendocino. There will be an emphasis in helping young people and replacing youth activities damaged by the fires. By working with Rotary, we know that our gift will go directly to people who need it with no overhead. Give more! As in past years, The Healdsburg Food Pantry will be onsite at the Turkey Trot this year to collect donations of non-perishable food for the local community. Take a look at the list of foods and other items they need most so you can plan your donation. Special thanks to our founding partner Healdsburg Running Company and to our sponsors Bellwether Farms, Costeaux Bakery, Guayaki, and Healdsburg Chamber of Commerce and Rotary Club of Healdsburg Sunshine.